Garth Brooks is returning after nine years of retirement. 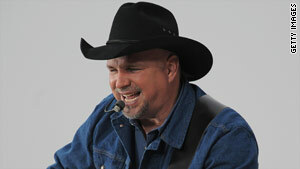 Brooks describes himself as "an average guy"
Las Vegas (CNN) -- The theater was packed as Garth Brooks shared stories about why he decided to officially step out of retirement after nine years. Camera crews and journalists filled the front section. Executives flanked the sides. And then smack dab in the middle of the audience was a row of chefs, enthusiastically applauding in their toques and kitchen whites. Yes, the media was buzzing about the much-anticipated announcement, but hotel employees at the Wynn Encore in Las Vegas were equally excited -- maybe even more so, because of the part they played in persuading the country music superstar to enter into a five-year weekend residency at the establishment beginning December 11. This summer, as the media threw itself head-first into the death of Michael Jackson, the Oklahoma native quietly took the stage at the 1,500-seat Encore Theater in two hush-hush shows attended by hotel workers. One was an intimate acoustic performance; the other a concert with his full band. "I think my gift truly is I'm an average guy. What I like, an average guy likes. It's that simple. The music that I love, I find that most guys around me love, too," he told CNN in his dressing room after Thursday's news conference in Las Vegas. There's a big old-fashioned star on the door that says "Garth Brooks." It suits him. Even though he's pushed boundaries and rewritten rules in the music industry, he's still an old-fashioned guy with old-fashioned values -- work hard, stay humble and family first. It's the latter that led to his decision to hang up his mic and his Stetson in 2000. "We were retiring because I gotta get back to Oklahoma and raise my girls. Sandy and I were getting a divorce at the time, so I couldn't expect her to do my job for me any longer," he said. "We told the people that's what I'm going to do, and the people -- 99 percent of them -- said, 'Go. Go do what you gotta do. We'll be here when you get back,' and we'll see if they are." Brooks' three daughters -- Taylor, August and Allie -- are now 17, 15 and 13. When he retired, he famously stated that he wanted to be able to drive his kids to school every day. His new Friday-through-Sunday gig will allow him to keep his pledge of seeing them off to class until they head to college. Of course, the commute from his farm in Owasso, Oklahoma, to Vegas will be made a little faster with his new private jet -- an 11-seat Challenger, courtesy of Steve Wynn, the billionaire CEO of Wynn Hotels. "I don't know anything about jets," Brooks downplayed with a shrug. "It's got a cool interior, cool paint job, I don't know. But it gets me here (to Vegas), and it gets me home to see my girls. And so in that case, it's fabulous." "He's been happy being at home, attending every soccer game and knowing what his kids like to eat for breakfast," said singer Trisha Yearwood, whom he married in 2005. "We both came from a family where our parents were there every single day, and so we don't know any other way." On most weekends, Yearwood will be making the two-hour trip to Sin City -- and every now and again, she'll make an appearance with her husband on stage. "It's a 'Beauty and the Beast' thing, you know?" said Brooks. "I can start a song in one octave and end it up in three keys, not knowing that I've changed. She's precision -- perfect with feeling -- and that's impressive to anybody you bring out." From time to time, Brooks will bring out special guests, but for the most part, it's a one-man show -- just him, an acoustic guitar and a bunch of great songs and intimate stories. And, of course, there's the audience. "As long as my gift is here, as long as I open my mouth and it works," he said, "then I think my job is to keep doing it, you know?"